Up to date information on Live Flight Arrivals arriving at Manchester Airport across all three terminals. The live feed of flights on this page offers the most up to date live flight information for flights arriving and leaving Manchester Airport. The complex has three terminals that has hundreds of flights arriving from around Europe and the world. 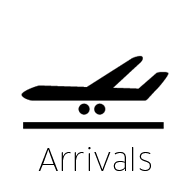 Live Flight Arrivals at Manchester Airport can be viewed by refreshing this page. As this is the unofficial site we can not be held responsible for any incorrect information displayed on thsi page. If you are in doubt please contact the airline directly or see the official site. Waiting for a plan to land can be frustrating time so this page will keep you up to date.